Consumers can be a prime target for identity theft, but most business owners assume that they won’t face the same level of risk. Even with security measures in place to safeguard your client’s confidential information, corporate identity theft can occur. The more you can do to protect your organization’s information from theft, the better. Most often, corporate identity theft includes a breach of personal information on clients or employees. However, it can also include the theft of a company’s proprietary information, credit information, bank statements and other sensitive data. Although recycling paper helps the environment, certain documents should never be thrown into the trash or recycling bin. If confidential information falls into the wrong hands, your business could suffer immensely. The thief can impersonate you and others within your business to steal from the company. Whether it’s running up credit card bills, purchasing equipment, applying for business loans, or using information for their personal gain, corporate identity thieves show no mercy. There are many types of corporate identity theft, but the most common is a cyberattack. This type of attack involves a hacker that is able to steal company information by hacking into a server or individual computer. Of course, this is done without the organization’s knowledge, in the same way data breaches affect consumers. Other types of theft include when physical company documents or records are stolen. It can happen either from within the business at the hands of an employee or even if paperwork is mishandled or improperly discarded. Regularly changing logins, passwords and other methods for accessing corporate bank accounts, credit cards and other important files can help prevent corporate identity theft. Company employees can sometimes be duped into logging into a fake website which matches the one they normally log into. After they log in, the hacker can easily steal information to get account numbers, trade secrets, proprietary formulas and more. Phishing is another way that identity thieves will try. An employee may receive company emails that appear to be from a trusted source but contain fake links. Once these links are clicked upon, hackers can access to the company’s network. 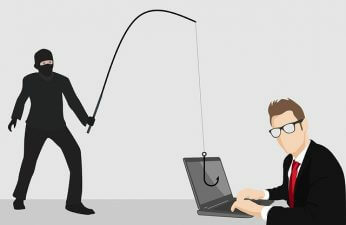 Phishing emails can also dupe employees into providing logins and other sensitive information. Any size company can be vulnerable to corporate identity theft, so it’s absolutely crucial to put safeguards in place that will protect your business. To ensure that your company does not fall prey to criminals, be sure to update safety procedures, train your team on how to spot phishing attempts and definitely implement a shredding policy and schedule. IntelliShred has been awarded the highest security rating, “AAA Certified” by the National Association for Information Destruction (NAID). Contact us today on how we can help save your business from corporate identity theft.